Flower City Glass has been installing all types of storefront glazing systems since their inception into the industry. We have the experience and proficiency to be one of the most competitive firms in Central and Western New York, providing both simple run-and-gun storefront to the more complex and sophisticated storefront glazing systems. We have the very best fabrication equipment utilizing CNC machining to ensure the most accurate joinery and we pride ourselves on installing storefront systems according to manufacturers’ reccommendations. Storefront glazing systems need to be built and installed to perform under the harsh weather conditions over long periods of time, that’s why we work with several well-known manufacturers with proven tested systems that perform to stringent industry standards. 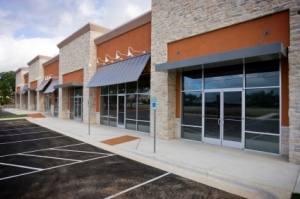 There are critical details to know when installing storefront systems that can cause significant issues if not done correctly. This is why our team of project managers, designers and installers do not cut corners in our production and installation processes. We stock standard thermal and non-thermal center glazed storefront systems in clear or bronze anodized finishes to be able respond to a project with short lead-times.